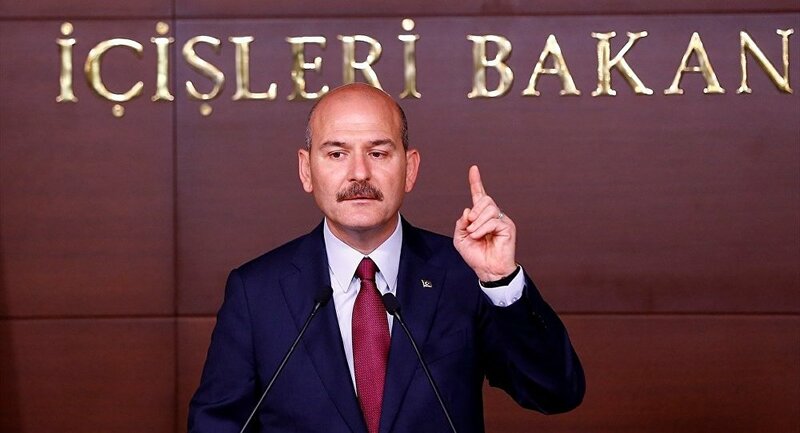 Süleyman Soylu, Turkey’s Interior Minister, lambasted the opposition, Nation Alliance (CHP & IYI Party), for associating itself with pro-Kurdish Peoples’ Democratic Party (HDP). Speaking at an election gathering in the Yenimahalle district of the capital city, Ankara, Soylu accused HDP of providing manpower to the outlawed Kurdistan Workers’ Party (PKK). “HDP is part of the abasement and malady alliance,” he said, referring to the Nation Alliance. “Plain and simple!” exclaimed Soylu as he scolded the opposition for HDP’s tacit endorsement by not producing candidates for three metropolitan municipalities. “The PKK is part of it too!” he continued. “The so-called MPs of HDP are going to march here and there for Öcalan!” Soylu said as he criticised the HDP lawmakers who are gearing up for marches in several cities to protest the isolation terms implemented on the imprisoned PKK chief, Abdullah Öcalan. Leyla Güven, the HDP MP who is on a hunger strike to protest the isolation terms of the PKK leader, is going to enter the 100th day of her act on February 15. HDP lawmakers are also planning to march from Taksim square to Galatasaray square in Istanbul on Monday to endorse her stance. “I will be damned if I let you walk!” threatened the interior minister to the HDP MPs. Soylu also announced that the Turkish government is once again on the verge of taking serious judicial action on the Gulen Movement. “We are going to wipe them off from the face of this country!” raged Soylu, threatening the Gulen movement affiliates with extermination. The Gulen Movement is led by a US-based cleric, Fethullah Gülen, who is seen by Turkey as the main player behind the coup attempt of 2016. Gulen denies any involvement in the matter. Turkey has long been pushing for the extradition of Gulen, but the US has rejected the Turkish requests saying that the demands lack substantial evidence. Since the coup attempt, some 150,000 civil servants were expelled from their jobs on accusations of affiliation with the group, and some 40,000 people are currently imprisoned on allegations of membership.